Down syndrome = Low tone. I have spoken about this a few times now as it is ever present in everything we as people do. Some people with DS have more tone than others and there is all sorts of variations and degrees but they all have low tone. In lieu of speaking about all the draw backs of low tone, I am going to share a benefit of having low tone- Swimming! Anyone who has swam a lap recently, can attest to the intense work out it can be. Swimming works your whole body inside and out and really is a fabulous way to stay healthy and active. Swimming requires strength and flexibility and if you want to be really good at it, then having low tone will give you an edge! Anyone can have low tone, it is not only a Down syndrome thing. Lily’s developmental pediatrician once told me that the reason a recent olympic swimmer was so good was because he has low tone. I won’t bore you with the physiology of tone but instead move onto to Lily. I first introduced Lily to water (aside from baths) when she was 6 months old. 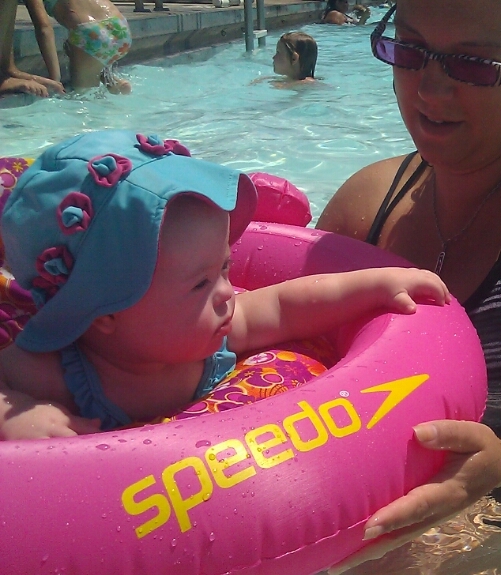 I got her the cutest little swimsuit and hat, grabbed some friends for fun and support and ventured to a local pool. As soon as I greased her up with sunscreen, had an internal debate on whether or not to put sunscreen on her head (I chose the hat instead) and mentally prepared myself, I stuck her tiny little feet in the pool. To say she liked it would be a serious understatement. Her whole being lit up and from that moment she was hooked! 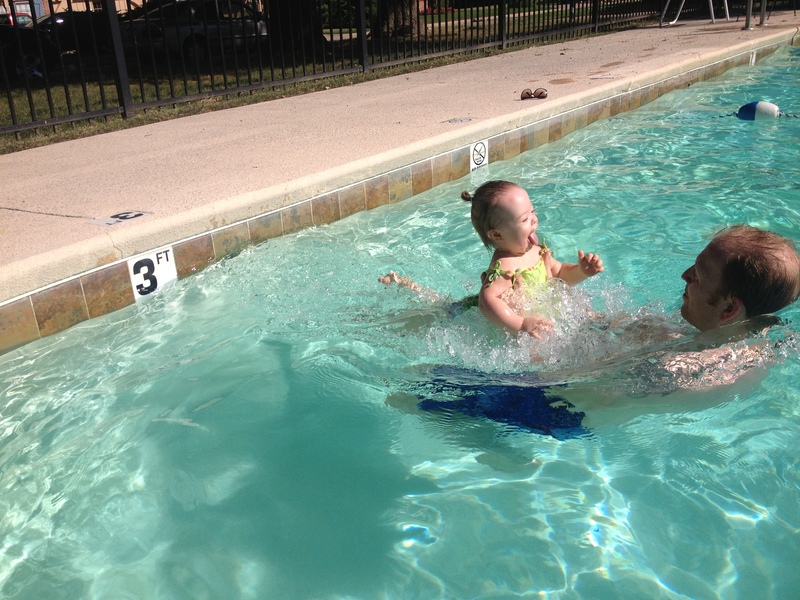 We went swimming every week that summer and each time she was braver and braver – she even went under! She had such a sense of calm and easily flowed with the water. When this last summer rolled around, I was heavily pregnant with Oz but was still hell bent on getting my swim on with Lily. Our first swim of the season totally caught me off guard. I finally felt confident with my chosen attire and had everything packed. We hit the pool and immediately hit the water. I thought she would enjoy being held and swimming with me, maybe even learn to kick her feet. No. She wanted to swim – without me. She kept asking for down and trying to wrestle out of my arms! Since my belly was gigantic it was a very uncomfortable and miserable experience for me and for her. I wasn’t prepared for her to want such independence and show such confidence at the pool and didn’t think to buy her floaties or anything! After Oz was born, we went a few more times and really enjoyed ourselves- she learned to “jump in” the pool, kick her feet, blow bubbles, and of course drink the pool water (ew!). Unfortuantely, she had tubes placed in her ears back in March so going under was not an option, which she was upset about- she really wanted to swim like we did. I know that Lily will always have to battle her body when it comes to physical activities. I take so much comfort in knowing that at least with swimming, she was practically born to do it! 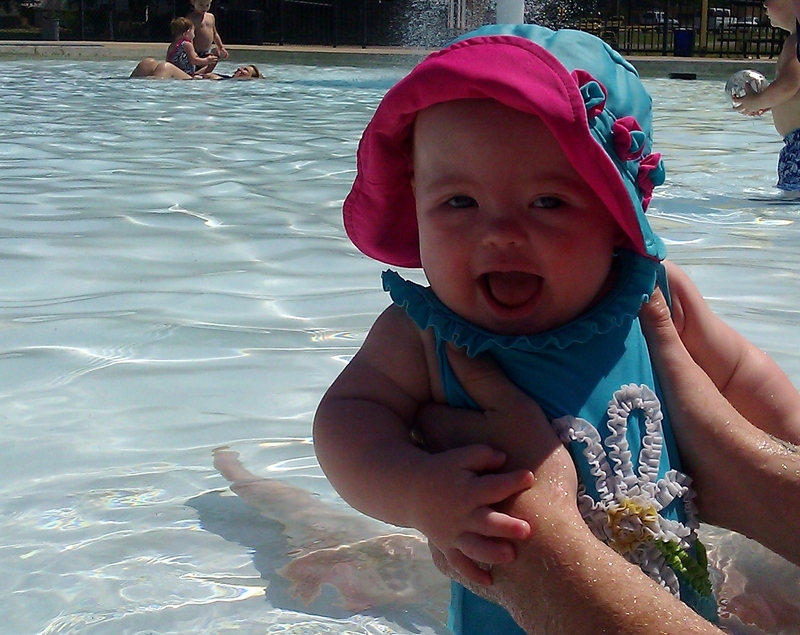 I hope she continues to love the pool and I look forward to spending the summers in the water! This entry was posted in Down Syndrome Awareness Month and tagged Down syndrome, Inflatable armbands, Swimming, Swimming pool, Swimming Pools and Spas, Water. Bookmark the permalink. We never had any problems with water or tubes!